The seat belts in the Buick Regals didn’t come from the factory with anything special on them. They were just plain old cloth attached to buckles & bolts, colored to match the interior of the vehicle. 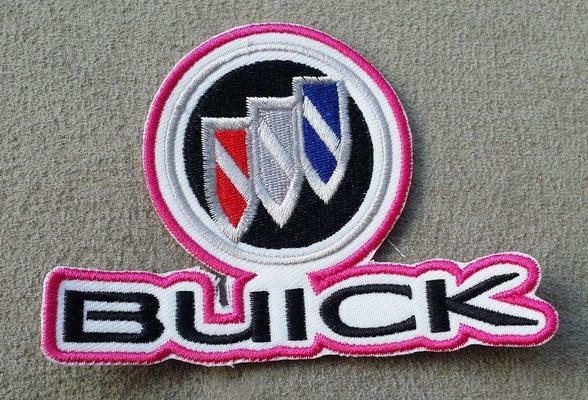 For a neat customizing effect on your turbo regal, you could take some of these Buick patches & sew them onto the seat belts for a one of a kind special touch! The first 3 shown below measure 1.25″ x 4.75″ in size. Center them width-wise on the belt. Where exactly you put the placement on the belt (length-wise), depends. Do you want them near the buckle part, so they can be seen when the seat belt is NOT in use? Meaning they will be near the top of the seat, towards the head rest, by the seat belt loop that hangs off the side of the seat? If you place them here, realize that if you are not the only driver, they may interfere with each varied driver (since the buckle part slides up & down, and the different drivers may have the buckle in a different position). Perhaps you should place them near the part that attaches to the floor. (no variance on different drivers as above, but may not be as noticeable to onlookers). Another choice is to sit in the seat, fasten the belt, then mark a spot on the belt where you’d like it. Maybe up near where the belt meets your left shoulder (or between your shoulder and the belt loop, a very noticeable spot that others can see when you are wearing your seat belt). 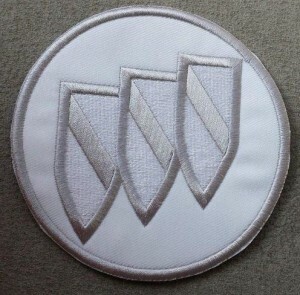 The other patches shown below measure about 3″ (either square or tall). In the case of the 3″ height ones (where the length is longer), they will look fine when you have the seat belt on, but when not in use, appear sideways (depending on exactly where you attach them on the belt) – (or are not visible at all, since if higher up on the belt, would retract into the section of the B pillar). For the square patches, this could have the opposite effect. Depending on which way you attach them, they could look “readable” when not in use, but are sideways when IN use. Or vice-versa, depending on which way “up” you place the patch! Meaning: THINK about it both ways, and visually LOOK at it, BOTH with the seat belt undone & ALSO with you IN the car, WITH the seat belt buckled in! 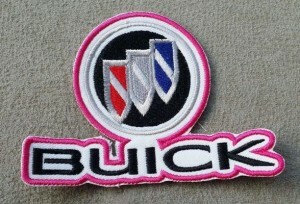 Of course, this is just an idea for you, a slick neato item to further customize your Turbo Buick. These patches look equally well on a jacket or hat! These are great little devices that wrap around your seat belts (removable) and slide up & down to adjust for your comfort, so that the belt doesn’t dig into your shoulder when you’re driving!